Well, we were smart enough to know how to get to the train station this time. We also knew what to expect traffic-wise. But we weren’t smart enough to NOT park at the train station. It was simply too convenient a place for what we wanted to do. Goodbye 50 Euros. When you go to Florence, there are some things you have to do. Things you would be foolish not to do. I mean really–would you want to come back from Florence and admit that you did not see Michelangelo’s David? Or somehow Brunelleschi’s Dome had escaped your notice? Of course not. That would be silly. But at the same time, you don’t want to only do those things. Do you really get a taste of Florence by hitting the tourist areas? What about visiting the shops, trying things from bakeries, and stopping for gelato? What about small, lesser known churches that are mostly empty? You have to budget some time for this kind of experience as well. I don’t have as many pictures for today as many of the places we visited didn’t allow them. We started with the Bargello museum. My hint for this museum is to go right when they open, which is 8:30 some mornings. It was nearly empty. I like feeling as if I have the run of a place. Here you can see some important Donatello, Michelangelo, and a plethora of other local sculpture. You don’t need a lot of time here–maybe a few hours at most, but we were done in about 90 minutes. One of the best things about being in Florence early is smelling and seeing all the baked goods that are fresh and ready to pop into your mouth for breakfast. There is a specialty here that everyone should try: they are Pane del Pescatore, or “bread of the fisherman.” The ones we picked up were still warm. I think the closest relative we have here in the US would be a scone or a biscuit. But they are denser than that. They are not super-sweet and are studded with whole almonds, raisins, and currants. The ones we sampled also had orange zest and a sweet glaze over the top. You can find these cookies on many streets in Florence, and the shops often stack these cookies into large towers of deliciousness. They make an excellent breakfast or mid-morning snack. I found some pictures and a recipe (which I haven’t tried yet) on the blog Cookie Madness (click for link). After the Bargello we met Freya at the Accademia. The Accademia is a MUST DO, for that is where you can see David in all his glory. My hint for the Accademia: pay a few euro extra and get “Reserved” tickets in advance. It saves so much time as you get to walk past all the people waiting for “on demand” tickets. Kind of like a fast-pass at Disneyland. I had to repress the urge to sneer “Suckah’s!” as I walked by. Of course, there is a great deal of art here besides David, but let’s get real–that is why most people are there. And they should be. This is one of those pieces you must see in person. He is breath-taking. He is exquisite. He is larger than life and inspirational. He is the poster child of the Renaissance. Don’t rush your experience with him. Take time and view him from all sides. Notice how his expression changes depending on the angle. Once you have gotten to know him, you have my permission to leave. Everything else pales in comparison. No not really, but you have to be careful with your eyes. In Florence your eyes can very quickly experience beauty fatigue. There is so to see that you can’t possibly see it all. If you are not careful amazing things can become mundane. Since we knew we were visiting the Uffizi later, we pampered our eyes and left. Freya took us to our next location which was my favorite in Florence. It is not as commonly visited, so let’s hope it stays a bit off the beaten path. It is the San Marco monastery. It is here that you can view art in its original surroundings. Viewing art in museums is great, but viewing art where it was intended to be is 100 times better. That is why visiting churches in Italy is a must. San Marco was home to a devout monk by the name of Fra Angelico. He also happened to be a talented artist, and his works typify the early Renaissance style. There is a museum downstairs with some fabulous works, but upstairs is the real treasure. 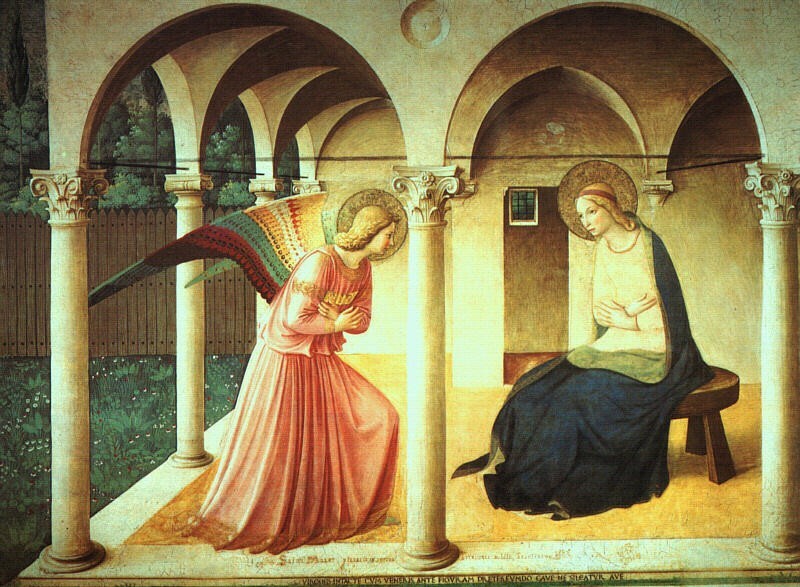 You head up some very plain stairs, and at the top, at the entrance into the dormitories, is Fra Angelico’s famous Annunciation. There is a window to the left of the fresco, and this is why it is best to see art in context: Angelico took that window into consideration and worked it in as the light source in the painting. It is as if this tender moment between Gabriel and Mary took place right there, in the San Marcos monastery. Gabriel’s wings literally sparkle. Seriously, it looks like he used glitter in the paint. No picture in the world can capture that sparkle. Once you have caught your breath, you can meander from tiny cell to tiny cell. Each cell was a monk’s room, and each cell contains a fresco by Angelico or his followers chronicling the life and ministry of Christ. This is a special place worthy of your visit. If you wish to buy advance tickets (I believe ours were purchased right at the door), here is a link for you. Our next stop was the Medici Chapels at San Lorenzo. This is where you go to see some stunning Michelangelo. The Medici tombs were never completed, but the figures that decorate the small space fill it up with their presence. Again, considering the fact that you are in a small room chuck full of original Michelangelo, the room was nearly empty except for us the entire visit. Additionally, San Lorenzo if a prime example of Florentine mosaic. Florentine mosaic is intricate stone work where pieces of different shapes are fit together like a puzzle, rather than bit of glass or pottery arranged in mortar. It makes my skin crawl just looking at it. Looks like big white worms. Jake said that it tasted good, but that the bumpy, chewy texture was not his favorite. To his credit, he ate it all. Not to my credit, I deemed it disgusting without even trying it. This is where being brave really can enhance your travel experience. 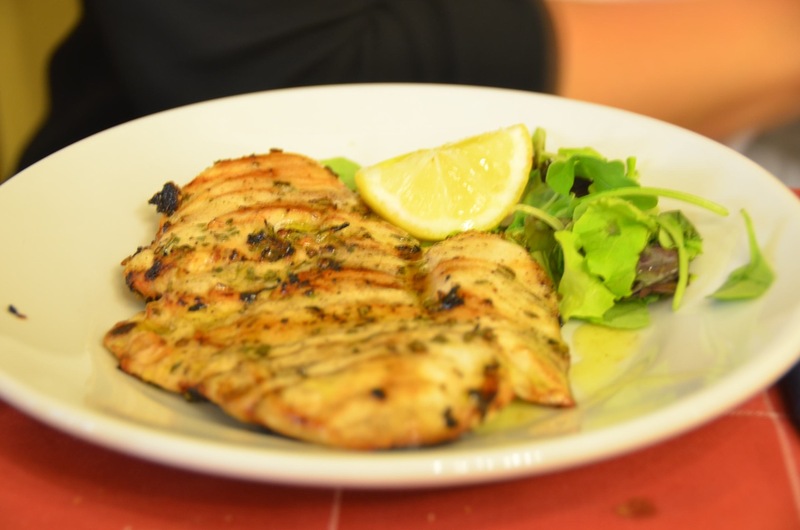 I ordered the grilled chicken, which was quite possibly the most tender and flavorful chicken I have ever had. I loved the fresh lemon and gobbled all the greens that came with the chicken. 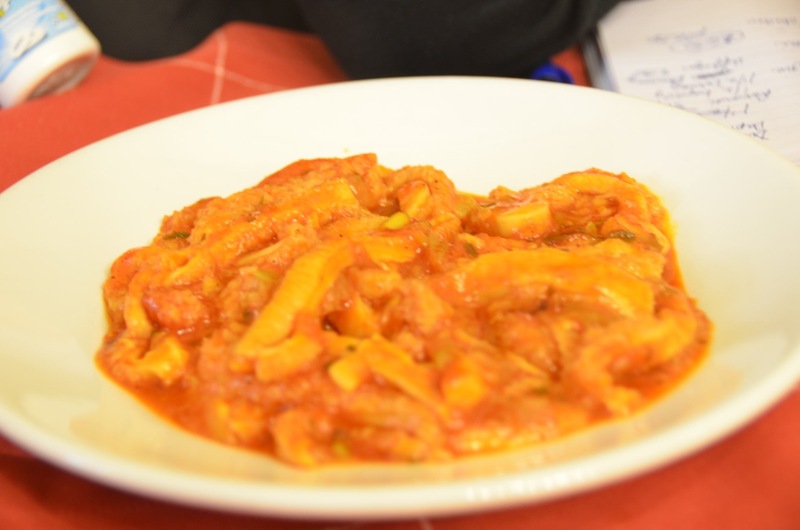 We also split some bowls of gnocchi before the arrival of the meat course. Before lunch we bid farewell to Freya, as we had only scheduled a half day with her. For the rest of the day we planned on visiting the Duomo, Baptistery, and Uffizi. We were able to visit two out of three places. 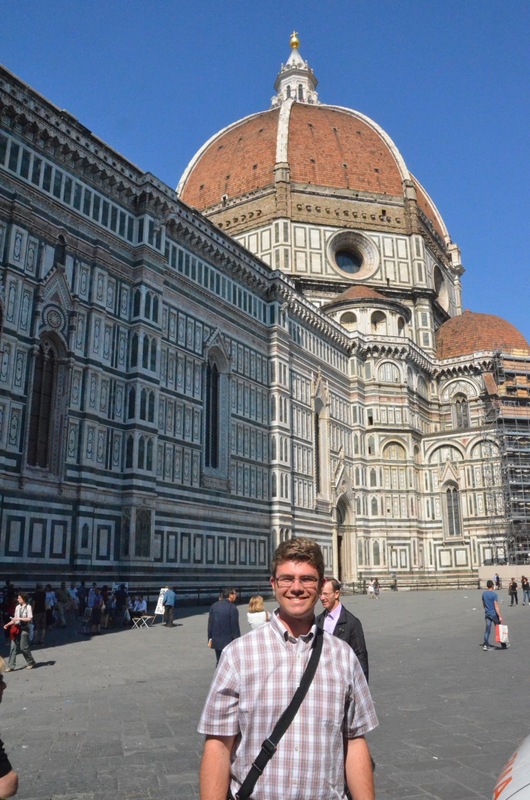 Another tidbit of advice: the Duomo closes early many days! This was serious! We couldn’t just NOT VISIT the DUOMO. Or see that amazing dome! We quickly formed a plan to visit Florence again before leaving Italy. But the closure didn’t prevent us from taking exterior shots! We finished our art sight-seeing by visiting the Uffizi. The Uffizi, literally “offices,” is a large museum of mostly Renaissance art. It is perhaps the largest collection of Italian Renaissance art in the world. Which makes sense, as Florence was the capital of the Western Renaissance. NOTE: You need to make reservations at the Uffizi if you want to guarantee your ability to get in. The problem with the Uffizi is the same as the Accademia. Your eyes and brain get fatigued so quickly. Ideally, I would visit the Uffizi every day for a month long stay, looking at individual pieces leisurely and with great concentration, for perhaps 90 minutes at a time. Well, I only had the afternoon and evening at the Uffizi. Not enough time to really absorb it all, but plenty of time to get worn out. So I literally skipped entire rooms and tracked down pieces I knew I wanted to see. I would highly recommend the Botticelli. 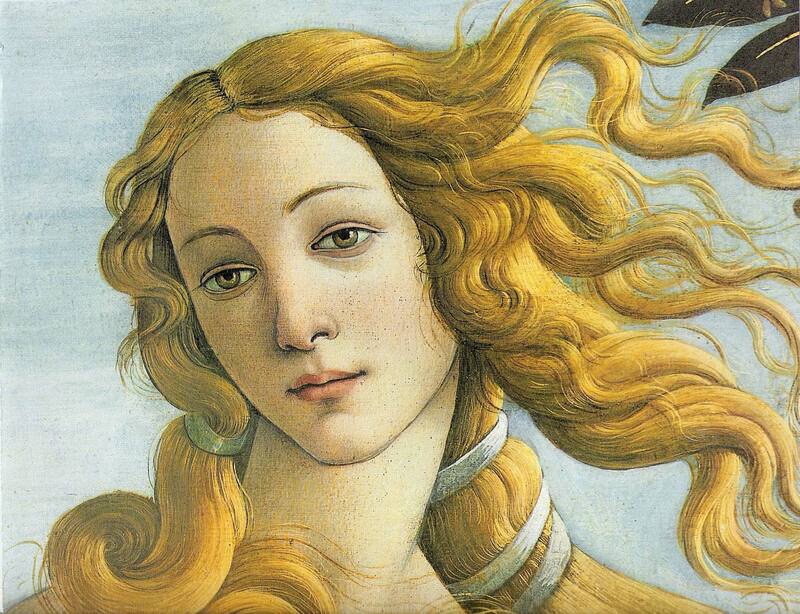 His Birth of Venus and Primavera bring tears to my eyes simply because they are so beautiful. I love his pastel colors, the delicate, black outlines, the whimsy, and fairytale like feeling. Above all I love his rendering of faces. I mean, how can you deny such beauty? There are too many beautiful works to mention here, but some of my favorite artists are Fabriano, Ghirlandaio, Giotto, Lippi, and da Vinci. There is sculpture here as well, but in general, the Bargello is known for sculpture and the Uffizi is known for painting. The one down side of our day was that we were lacking half of our travel companions. Some people were not feeling well, so they had to stay home and recuperate. I guess we need a re-do on the day! I am up for that. Any time. I love your suggestions. I think your son was very brave to tackle trip. I’m with you, I can’t even look at it. He also tried baby squid too. I just can’t do it. Well, maybe I could, but my severe allergy to seafood taints the desirability!